Welcome back mate! Good luck for the contest! Hide 145 comments... Click to show. I dunno, i don't have a lot of time these days..
Long time.. missed some contests.. Damn.. I wasn't on for a looong time.. Sorry fanup!!! oh in that case... anyway do you play LoL? What do u mean with play? I still play games ye! i mean if you are playing League of Legends. Dayuumm. When do you become guardian, noob?! :3 hehe. Happy BDayyy! Enjoy your day! Doing anythin special? ^^ try this saturday between 10 and 12 pm (fanup hour) I think u will get 80% to find him online and Gl ! You've made some pretty good guides already. Really that is how you get, if your seen to be creating great guides with good presentation, good quality, spelling & grammar e.t.c. You can get it. Maybe you can speak to Splooshi privately about it. As it seems people posting that they want it on his profile - has been regarded as "begging" by some. I agree... I'm sure with summer approaching it will become even more active. exerath Kör pow lek kann sich über mehrere Aufträge für mich, das Angebot zu öffnen? Lol also u speak french too or only flamant? IDK but I remember you gave me a tip. That would be nice, but if it is possible? Maybe this will come soon, because there are too much spammers. are u a guardian or moderator joinron? You still owe me 200 gcoin bro! I won't rage, just mad because that kick was bullcrap. It had no legit reasons. Yea.. it's limited edition. lols..
Are you playing all theese games? u need help in how to reformat? Hmm ik ben bezig, maar kan ik ook content van andere guides vanmij gebruiken? 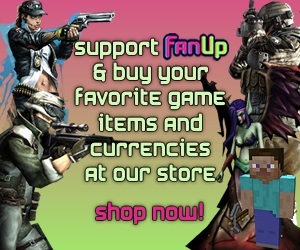 Hey FanUp the best ! Congratulations on your site! Hey joinron, You can not make more accounts while you payed once, you bought one copy, see it as a CD-key. You can only use it once. i just want to ask how to get the 100th visit badge?? Nope it's 100 logging into FanUp, not visiting. Advance FanUp Ultimate Guide™ has now been updated with new FanUp Auction Info! Check it out now! Note: Apologies on small text, I'm unable to edit this atm. I don't play AVA sorry! I would like to ask if you have a Facebook account? Maybe you would like to add me? Okay, I'll try find you! Okay, I'll try find you too! It is the currency you gain from guides and screenshots etc. Maybe you can read advances guide? A lot of users definitely does. If that system really exists, it would be a really different Fanup! oh, isee even you like trance. No. Just my retarded dad, he won't let me play (my mom says that I can on the weekend evenings)... but that guy freaked out after I got a 3.4 and 5 for the test week... He didn't even look at my AWEZUM grades (I got a 10!!). Well, I couldn't make comments red. True :D But a lot of users spam. Have a try and you may win a third! Wie is die nieuwe gast in onze clan? Hij is wel goed :p maar is hij actief? Ehi mate! Sometimes check your email address as Norm give you some special tasks, exclusive for the efangelists, that give you 500 FANBUCKS when completed! But I don't get whats the task for assignment #2, mind give a hand? DUDE HIGHEST EVER 1400 FAN COINS vohoooo!!!!!!!! Should i make some more guides to get 3th place? Or am I save? Ye i saw xD I skipped only infection. Because i think it is something different.. It is my fault. XD And i will not do that.. But glitches are allowed? Yes, but only glitchs that allow to earn virtual currencies and goods for free (for example a glitch that allow to earn free GCoins: this damage and undermine ijji). Will there ever be a fanup app xp? Thx for that.. And i have a last question, than i will stop ruining your time xp. Should i get a top 3 place with my fancoins now? I hope for the best..
i know! but i think about a chat window in the home page. so that everyone join fanup will see the chat! Lol. GJ on almost winning, make another guide to make sure you'll win! Hey clanleader, I still get 200 gcoin from you! You're in debts with me :p You originally said 240.. soo... GIMME GIMME GIMMEH!! You defenitly are the smaller version. grtz mate, on first coz im gonna go out,n wouldnt be able to participate in the wekly!! you are just a bit crazy .__. it's a bug. Sometimes it show the 10K badge and sometimes the 1K badge. The admins know that and are trying to fix. Hey man! congratz on the weekly! I really appreciate your work! you should participate this week to! Mate only 2 guides and 3rd I wonder what if u really participated btw do u play soldier front? Ye i know xD kinda weird.. No I don't play that. I tried but it feels so old and stiff..
50 fanbucks each post. 10 efanges give you 500 fanbucks extra..
Nah, i am not participating.. I just make them for fun. Ok I will read yours soon. I am a guardian. HUEHUEHUEU! Hola, no te olvides de ayudar a la comunidad participando en todos los eventos, participa en efangelist aqui podras ganar muchos fanbucks, has click para saber las reglas y como participar en este maravilloso evento. Who is a active fan? Hi Ron y follow you! Jammer Emiel, volgende keer wat meer guides posten, dan kan je misschien de weekly leaderboard winnen! Dont spam the same question over and over. Wait till someone answers your question. What you just did there would of gotten you banned. There is a specific page where you can post question such as the one you posted on the different game sections. You can ask one of the Guardians to help you out also :http://fanup.com/guardian-moderators or over at fanup.com/game/fanup-community-questions Dont ever spam like that again. Oh. This is bad. Red = Bad. Emiel probeer je ff in te houden, je spamt een beetje veel! xD Rales don't worrt he won't do it again :D it wasn't his meaning to spam! en btw, ik zie dat je tijd hebt voor guides, is je examending al klaar ofzo? MOET DIE 200 GCOIN HEBBEN! Can somebody explain me the benefits of making guides? Bwhahaha! Nice vogel :D Gaat het lekker op FanUp? Doe eFangelist ook op alternatieve sites zoals FB of Youtube :D eFangelist = baas en cool!